The term Diorama refers to a three-dimensional model of a landscape, event, space, scene or room, often enclosed in a glass showcase for exhibition purposes. In this definition, the essence behind the band’s artistic pathway is embodied: to build musical showcases for listeners, dancers and thinkers. And melancholics. 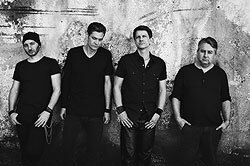 Diorama is a music band from Reutlingen/ Germany, brought into being by Torben Wendt in 1996. Diorama’s early works were characterized by an intimate, fragile disposition due to a strong focus on piano and vocal parts. In their further development, influences from gothic/ electro, alternative and rock have been incorporated. With their highly creative, intricate and genre-crossing way of producing music, Diorama have maneuvered themselves into a stylistic niche that can hardly be narrowed down. Diorama have played over 150 shows in more than 20 countries including Mexico, Israel, Canada, Russia and fan stronghold Serbia. Their current longplayer “even the DEVIL doesn’t care” -release date: January 25th, 2013- is their 8th studio album.